If you are like me and you tend to be a paper brain, this FREE software program may just be what you need! Check it out! It’s available for Mac, PC, phones and online… I’ve been using it now for a few days and it is FANTASTIC! I can enter info using my iPhone, my computer, while I am searching the internet, by speaking, by take a picture, so many options! Here is an example of what I did. This is also great for browsing the internet. Yesterday I used evernote to take a photo of this web page and then I downloaded another free software called Skitch, which allowed me to take a photo of my desktop and then circle the items inside the photo. I did this earlier today for something I wanted to share with my husband. I took a photo of my notes and circled the highlights. 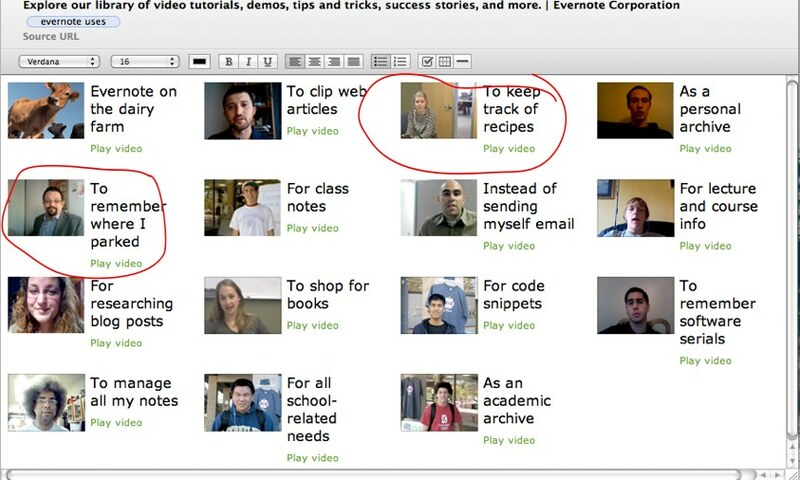 Visit the Evernote website for more ideas of how to use Evernote. 2. Don’t wash clothes after one wearing. Wait until they have a stain or an odor. This saves money on laundry, and less ironing time for you. 4. Never go anywhere empty handed. If you are going to a room, take something with you that needs to be put away in that room. 5. Buy attractive storage dishes, such as corning ware that can be used for cooking. This way you can serve in the same dish you cooked in and then the leftovers can go in the refrigerator still in the same dish. 6. Let your dishes air dry. It saves time and it’s healthier. Do you have a short cut tip that can help all of us save time and money? Share with us! The Cookie Exchange ~ bake one hour, have 15+ varieties of cookies! 2. Your goal is to have about 30 ladies attend, so be sure to invite more than that. 3. Send the invitations out a month before the party. 4. Choose recipes. The point of a cookie exchange is to end up with a variety of cookies after baking only one type. If everyone brings chocolate chip cookies to the cookie exchange, then the point of the cookie exchange will be lost. Encourage the members of your cookie exchange to try new and interesting recipes. Everyone loves to try new things and a cookie exchange will allow people to share this new recipe with several other people. 5. Make a list. Have everyone write down the recipe they will doing and make copies of it. Hand these out to all of the people who will participating in the cookie exchange. This way people will be more likely to stick to their recipes and you won’t end up with several batches of sugar cookies. 6. Tell everyone to bake their cookies two-three days in advance. The biggest reason for no-shows is that they didn’t have time to bake their cookies. This is the busiest time of year. After they bake them and allow them to cool thoroughly, they should be covered in an airtight container and refrigerated or frozen until they come to the exchange. No one wants stale cookies to take home! Have each person who is involved in the planning bring either a special hot drink or one plate of non-cookie snacks to eat at the exchange. Serve this as people are arriving and you are arranging the table. After everyone has eaten and socialized a bit, call the exchange to order by ringing a bell and gather into the room where the cookies have been laid out on the table as people arrived. Take turns and everyone introduces themselves and their cookies and any story that might accompany the cookie. For example; “My grandmother’s, grandmother passed this recipe down….” or I burned the first two batches, then switched recipes…” or “When I was a child, my old next door neighbor, Bertha, used to make this for all the neighborhood kids…” This part is fun, it is my favorite time of the party –because there is always a story….and there’s always a lot of laughter. 2. No plain chocolate chip cookies, cookie mix cookies, no-bakes, meringues or bars. 3. Please bring 10 dozen total cookies. 5. Arrange cookies in a basket or platter and be creative! Each person brings a large container to carry away their cookies, or the hostess can provide a take away container. 7. Dressy attire is encouraged! 8. RSVP ASAP with what type of cookies you are planning on baking – no duplicate recipes are allowed. 10. If you don’t have time to bake, or have burnt your cookies, but still want to attend, you must go to a real bakery and buy 6 dozen yummy cookies. This can even be played with friends that know each other well. Everyone writes down two true things and one not true about themselves. When everyone is finished, you go around the room and read the 3 things you’ve listed about yourself. One by one everyone guesses which is not true. After everyone has guess your answer, you reveal which is not true and you move on to the next person. Each guest keeps a tally of how many things not true they’ve detected. The person that guesses the most things not true, wins. Have you ever done a cookie exchange? Tell us about it! Our family is very fond of Ciabatta bread, specifically panini, so I decided that it was time for me to learn how to make it. A few weeks ago I went on a hunt online to find recipes and I came across two. I tried one at that time and I wasn’t happy with the way it came out. Then today I tried the other one and ohh, it is perfect. The great news is, this is the easier of the two! 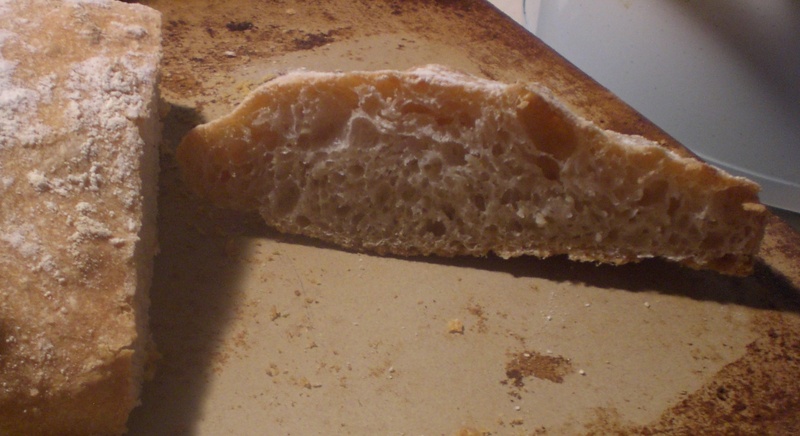 No-Knead Ciabatta Bread from Foodwishes on Vimeo.